The garage door is installed in a few hours. This garage door is an insulated steel door from the Overhead Door company. We opted for a remote control keypad to be installed on the outside of the garage door to allow easy access to the house if we are ever locked out, yet providing a secure barrier to entry. There are many options when it comes to garage doors. Choosing the right one is important because you will look at this door every day when you leave your house and return home. 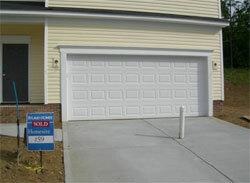 The garage door you chose door should be sturdy, safe, practical and attractive. You will want to get the best benefits possible and keep your door for a long time. Here are some important considerations when choosing a garage door. The materials used for the garage door are one of the most important considerations. It will also address other concerns such as durability and security as well as insulation. The materials that are frequently used for making garage doors are metals like steel, aluminum, wood and wood composite and fiberglass. The material that you will pick will also determine the maintenance that the door will need. Whatever you choose, you will need to clean and oil the tracks every year. Steel is one of the best materials for garage doors because it is affordable, durable and stylish. It can also be easily styled and maintained. You can opt to have a plain stainless steel garage door or a painted one. Aluminum is another metal that is good to use for making garage doors. It is much like steel, only lighter and cheaper. The only drawback is aluminum doors are prone to dents. The metals need not be prone to hitting, so steel or aluminum is not a good choice for garages that are near trees, playground, etc. Wood and wood composite are also good for garage doors. They are best for people with a traditional style. They are also affordable. They also provide or keep warmth. While woods are prone to termites, the composite woods resist rot and splitting. However, there are ways to make your garage doors resistant to termites or to treat existing termites. Wooden garage doors will also require you to do staining and sealing every four years. Fiberglass doors, are placed in aluminum frames, are best when it comes to resisting dents as well as corrosion due to salt water. They can also be painted any color you wish. There are also different types of garage doors based on how they operate. Some garage doors fold, tilt, swing and roll upwards. Choosing the type of garage doors may depend on the space you have and your personal preference. You may also choose between manual and automatic garage doors. Folding and rolling garage doors are best if you do not have much space. They do not require space inside or outside the garage unlike the hinged tilting and swinging doors. However, rotating and swinging doors are less expensive than the sectional roll up doors. The type of garage door that you will choose will also determine the security that you can get. In some cases, you may find your automatic garage doors open upon going home at the end of the day because the transmitter or other parts fail to function correctly. The insulation is something that most consumers forget about but should be considered especially if the garage is attached to your house. The garage doors with insulation may cost more but they help in reducing energy costs, so in the end, they are worth it. The insulation is normally covered with plastic or vinyl. To know which doors are better when it comes to insulation, you just need to look for the R-value. Higher R-value means better insulating value. You may also choose garage doors based on the company, manufacturer and dealer. For instance, you will find yourself choosing between companies that are the same in terms of material, type, style and insulation. You can just choose based on the company's reputation. You may also consider the warranty provided, as well as the services that are included such as installation and repair. Whatever choice you make, you need to make sure you look into all of the options available before making a final decision. It may be a good idea to contact a garage door company in your area to see what is available. It is always more helpful to choose a door based on something that you were able to see in person.